Allegiant Air may be headquartered in Las Vegas, but it’s Sanford that is the low cost airline’s No. 1 airport. 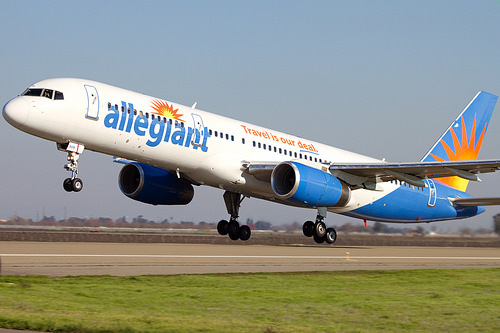 New data shows 171 Allegiant flights are scheduled to depart Orlando Sanford International Airport in July 2015. 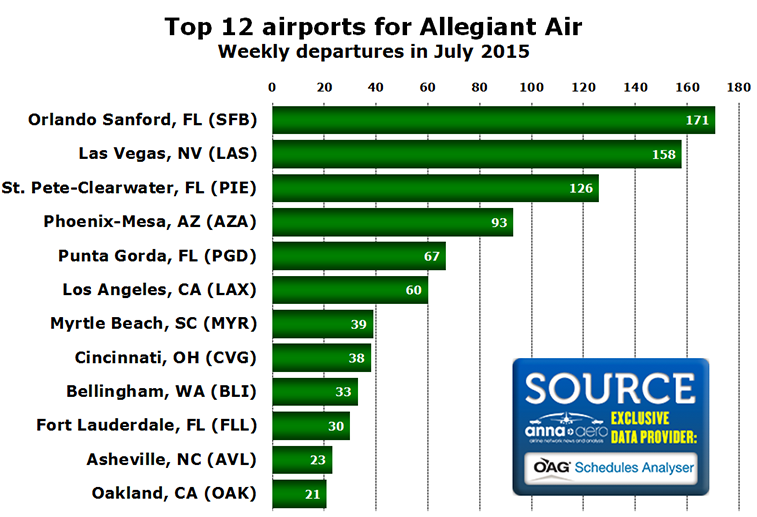 In fact, Florida airports serving Allegiant make up 46% of the flights at the company’s top 12 airports. Allegiant’s presence at the Sanford airport has made a drastic change at the former Naval Air Station. After the federal government turned the property over to the city of Sanford in the late 1960s, the airport was primarily a general aviation facility used by airplane enthusiasts. All of this is a feather in Sanford’s cap, but what does it really mean? It’s great to be Allegiant’s No. 1 airport, but how does that make Sanford better? What about all those landing fees and other taxes tacked onto the price of an airline ticket? Surely Sanford gets a piece of that money, right? Ha! Sanford Airport Authority (SAA) President and CEO Larry Dale is quick to point out that that money must be spent on airport operations as per federal regulations. The airport does provide lots of jobs, and there are a number of businesses located on the airport’s industrial property that provide additional jobs and taxes. The airport also raises Sanford’s profile. For instance, a friend of mine in Lakeland says her friends know Sanford almost exclusively because of the airport. For a city that has struggled with its image, that’s positive publicity we could use. The question remains: Is the airport being maximized to the city’s benefit? In my mind no, not by a long shot. For starters, the airport is city property, yet the Sanford Airport Authority pays no lease. Imagine what services could be provided – or property taxes cut – if the SAA began making a $1 million annual lease payment. What about those 2 million+ passengers traveling to and from Sanford? Is enough being done to capture those people, and more importantly their money, to benefit Sanford’s economy? While many of those flying into Sanford are coming for Disney and the tourist attractions, there are opportunities to boost the local economy. The airport must begin doing more. This is not an indictment against Dale. He and his private sector partner Larry Goldthorpe (Sanford’s airport is operated by a public-private partnership between the airport authority and ADC & HAS Airports Worldwide) have done a tremendous job building the airport into what it is today. With Dale scheduled to retire in September (Larry Dale to retire as airport CEO), the airport authority has an opportunity to hire a leader who can not only continue the airport’s growth and importance to the traveling public, but one who can ensure this city of Sanford asset is used to its maximum potential to benefit the citizens of Sanford. If you’re interested in expressing your thoughts on the issue, here is a list of board members so you can contact them. Messages can be left at the SAA office at 407-585-4000. One important community issue ignored by the SAA & the City of Sanford & the Seminole county commission is the self serving, mismanaged property acquisitions program which suits only the Airport & does an enormous injustice to dozens of residents on the east side of this airport. It has displaced numerous family’s, causing Condemnation Blight among the remaining residents who can no longer market their land as it is all under the cloud of future eminent domain. Many lawsuits have resulted from the conduct of the airports management. Noise & residue from aircraft operations has disrupted sleep patters for everyone, health issues , roads have been closed & streets turned into dead ends forcing remaining residents to travel up to 21/2 extra miles one way to & from their property’s. The SAA has shown no interest in concern for these residents & continues to expand without any community concern . When confronted with these issues the airport denies any involvement on their part & forces residents to seek legal protection. The powers to be in the City & County have not addressed these residents concern & it has become obvious that their personal relationship with some of the airports management overrides their sworn obligations to the community & the remaining residents. When will elected leaders come to the aid of their community?